Pierre-Augustin Caron de Beaumarchais (January 24, 1732 – May 18, 1799) was a watch-maker, inventor, musician, politician, invalid, fugitive, spy, publisher, arms-dealer, and revolutionary (both French and American). He was best known, however, for his dramatic works, especially the three Figaro plays. The Marriage of Figaro served as the basis for the great opera of Wolfgang Amadeus Mozart. His life and works reflect the tumultuous period in which he lived, including the period to and through the first phase of the French Revolution. His Figaro cycle covers the breakdown of the old, Medieval world and the birth pangs of the new, democratic world. Beaumarchais was born "Pierre-Augustin Caron," the only boy among the six children of a watchmaker. The family was comfortable and Caron had a peaceful and happy childhood—in contrast to his adult life. Caron left school at age 13 to apprentice under his father. A few years later, possibly between 1751 to 1753, he invented an escape mechanism that made possible a substantial improvement in the accuracy and compactness of watches. One of his greatest feats was a watch mounted on a ring, made for Madame de Pompadour, a mistress of Louis XV. The invention was later recognized by the French Académie des sciences, but only after a tussle with M. Lepaute, the royal watchmaker, who attempted to pass off the invention as his own. His watch-making days were short-lived, as other endeavors soon catapulted him to fame and fortune. In 1758-59, Caron was the harp tutor to King Louis XV's daughters. In 1759-60, Caron met Joseph Pâris dit Duverney, a wealthy, older entrepreneur who saw great potential for business in the young Caron. The two became very close friends and collaborated on many business ventures. Caron began using the name "Pierre-Augustin Caron de Beaumarchais" in 1756-57. He derived Beaumarchais from the name of a piece of land, "le Bois Marchais," inherited by his first wife. Generously assisted by Pâris-Duverney, Beaumarchais purchased the office of secretary-councillor to the King in 1760-61, thereby becoming a French noble. In 1763, Beaumarchais purchased a second office, the office of Lieutenant General of Hunting. In 1764, Beaumarchais began a 10 month sojourn in Madrid, supposedly to help his sister, Lisette, who had been abandoned by her fiancé, Clavijo. In fact, he was mostly concerned with striking business deals for Pâris-Duverney. Although Beaumarchais returned to France with little profit, he had managed to acquire new experiences, musical ideas, and, most important, ideas for theatrical characters. Beaumarchais's characters of Figaro and Almaviva first appeared in his Le Sacritan, which he wrote around 1765, dubbing it "an interlude, imitating the Spanish style." His fame began, however, with his first dramatic play (drame bourgeois), Eugénie, which premiered at the Comédie Française in 1767. This was followed in 1770, by another drama, Les Deux amis (The Two Friends). On July 17, 1770, his long-time business partner Pâris-Duverney died. This began a decade of turmoil for Beaumarchais. A few months before his death, the two signed a statement which canceled all debts Beaumarchais owed Pâris-Duverney (about 75,000 pounds), and granting Beaumarchais the modest sum of 15,000 pounds. Pâris-Duverney's sole heir, the Count de la Blanche, jealous over the deceased's relationship with Beaumarchais, took Beaumarchais to court, claiming the signed statement was a forgery. Although the 1772 verdict favored Beaumarchais, it was overturned on appeal in the following year by a judge, the magistrate Goezman, whose favor La Blanche had managed to win over. At the same time, Beaumachais was also involved in a dispute with the Duke de Chaulnes over the Duke's mistress, which resulted in Beaumarchais's being thrown into jail from February to May, 1773. La Blanche, taking advantage of Beaumarchais's inability to appear in court, persuaded Goezman to rule that Beaumarchais owed Pâris-Duverney's estate the 75,000 pounds allegedly forgiven, plus interest and court costs, effectively ruining Beaumarchais. To garner public support, Beaumarchais published a four-part pamphlet entitled Mémoires contre Goezman which made Beaumarchais an instant celebrity—a champion for social justice and liberty. Goezman countered Beaumarchais's accusations by launching a law suit of his own. The verdict was equivocal. On February 26, 1774, both Beaumarchais and Mme. Goezman (who sympathized with Beaumarchais) were deprived of their civil rights, while Magistrate Goezman was removed from his post. At the same time, Goezman's verdict in the La Blanche case was overturned, so that Beaumarchais was no longer ruined. The Goezman case was so sensational that the judges left the courtroom through a back door to avoid the large, angry mob waiting in front of the court house. Beaumarchais pledged his services to Louis XV and his successor, Louis XVI in order to restore his civil rights. He traveled to London, Amsterdam, and Vienna on various secret missions. His first mission was to travel to London to destroy a pamphlet, Les mémoires secrets d'une femme publique, that supposedly libeled one of Louis XV's mistresses, Mme. du Barry. Beaumarchais is most remembered for his essential support for the American Revolution. He convinced Louis XVI to pay for supplies to the American revolutionaries by falsely claiming that Louis XV had been in favor of assisting the American Revolution. Louis XVI, who did not want to break openly with England, allowed Beaumarchais to found a commercial enterprise, Roderigue Hortalez and Co., supported by the French and Spanish crowns, whose real purpose was to supply the American rebels with weapons, munitions, clothes, and provisions. For these services, the French Parliament reinstated his civil rights in 1776. Shortly after Voltaire's death in 1778, Beaumarchais set out to publish Voltaire's complete works, many of which were banned in France. He scoured all of Europe for Voltaire's many scattered manuscripts. To evade French censorship, he set up printing presses in Kehl, Germany, and purchased paper mills. Seven volumes were published between 1783 to 1790. While the venture proved a financial failure, Beaumarchais was instrumental in preserving much of Voltaire's later works, which otherwise might have been lost. It was not long before Beaumarchais again crossed swords with the French legal system. In 1787, he became acquainted with Mme. Korman, whose husband had her imprisoned for adultery to expropriate her dowry. In fact, her husband had engineered the adultery to implicate both his wife and the lover. The matter went to court, with Beaumarchais siding with Mme. Korman, and M. Korman assisted by a celebrity lawyer, Nicolas Bergasse. On April 2, 1790, M. Korman and Bergasse were found guilty of calumny (slander), but Beaumarchais's reputation was also tarnished. Meanwhile, the French Revolution broke out. Beaumarchais was no longer the idol he had been a few years before. He was financially successful (mainly from supplying drinking water to Paris) and had acquired rank in the French nobility. In 1791, he took up a lavish residence across from the former site of the Bastille. He spent under a week in prison during August 1792, and was released only three days before the September massacres took place in the prison where he had been detained. Nevertheless, he pledged his services to the new Republic, and attempted to purchase 60,000 rifles for the army in Holland, but was unable to complete the deal. While he was out of the country, Beaumarchais was proscribed and declared an émigré by his enemies. He spent two and a half years in exile, mostly in Germany, before his name was removed from the list of proscribed émigrés. He returned to Paris in 1796, where he lived out the remainder of his life in relative peace. He is buried in the Le Père Lachaise Cemetery in Paris. Beaumarchais married three times. His first wife was Madeleine-Catherine Franquet (née Aubertin), whom he married on November 22, 1756, but died of mysterious circumstances only 10 months after. He later married Genevièfve-Madeleine Lévêque (née Wattebled) in 1768. Again, the second Mme. de Beaumarchais died of mysterious circumstances two years later, though most scholars believed she actually suffered from tuberculosis. 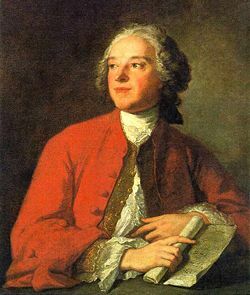 Beaumarchais had a son, Augustin, in 1770, only eight months after his second marriage, but he also shared the tragic fate as his mother, and died in 1772. Beaumarchais lived with his lover, Marie-Thérèse de Willer-Mawlaz, for twelve years, and had a daughter, Eugénie, before she became Beaumarchais's third wife, in 1786. In his first two marriages, Beaumarchais was accused—mainly by his enemies—of poisoning his wives in order to lay claim to their family inheritance. Beaumarchais, though having no shortage of love interests, was known to marry for financial gain. Both Franquet and Lévêque were previously married to wealthy families prior to their marriage to Beaumarchais. There was insufficient physical evidence to support the accusations, and he was also known to be very caring for his family and close friends. Whether or not the poisonings took place is still subject of debate. Beaumarchais's Figaro plays comprise Le Barbier de Séville (The Barber of Seville), Le Mariage de Figaro (The Marriage of Figaro), and La Mère coupable (The Guilty Mother). These plays are of historical significance, as the trilogy spans the most turbulent period of French history. Figaro and Count Almaviva, the two characters Beaumarchais most likely conceived in his travels in Spain, were (with Rosine, later the Countess Almaviva) the only ones represented in all three plays. They are indicative of the change in social attitudes before, during, and after the French Revolution. The two began in a formal master-and-servant (albeit light-hearted) relationship, in Le Barbier; the two became rivals over Suzanne in Le Mariage, a personification of class struggle in pre-revolutionary France; and they finally join hands again to thwart the evil schemes of Bégearss, an attempt to call for reconciliation in La Mère. Beaumarchais dubbed La Mère "The Other Tartuffe," paying homage to the great French playwright Molière, the author of Tartuffe. To a lesser degree, the Figaro plays are semi-autobiographical. Don Guzman Brid'oison (Le Mariage) and Bégearss (La Mère) were caricatures of two of Beaumarchais's real-life adversaries, Goezman and Bergasse. The page Chérubin (Le Mariage) resembled the youthful Beaumarchais, who did contemplate suicide when his love was to marry another. Suzanne, the heroine of Le Mariage and La Mère, was modeled after Beaumarchais's third wife, Marie-Thérèse de Willer-Mawlaz. Meanwhile, some of the Count monologues reflect on the playwright's remorse over his numerous sexual exploits. Le Barbier premiered in 1775. Its sequel, Le Mariage, was initially passed by the censor in 1781, but was soon banned from performance by Louis XVI after a private reading. The King was unhappy with the play's satire on the aristocracy. Over the next three years Beaumarchais gave many private readings of the play, as well as making revisions to try to pass the censor. The King lifted the ban in 1784. The play premiered that year and was enormously popular even with aristocratic audiences. Mozart's spectacularly successful opera on The Marriage of Figaro premiered just two years later. The Barber of Seville was turned into a successful comic opera by Rossini in 1816. The final play, La mère, was premiered in 1792, in Paris. All three plays enjoyed great success, and they are still frequently performed today. 1991—The Ghosts of Versailles, opera based loosely on La Mère coupable, music by John Corigliano, libretto by William M. Hoffman. 1991—Den brottsliga modern, opera based on La Mère coupable, music by Inger Wikström, libretto by Inger Wikström and Mikaael Hylin. Edney, David, trans. Beaumarchais: The Three Figaro Plays. Doverhouse, 2000. Feuchtwanger, Lion. Proud Destiny. Viking, 1947. This page was last modified on 3 April 2008, at 18:16.